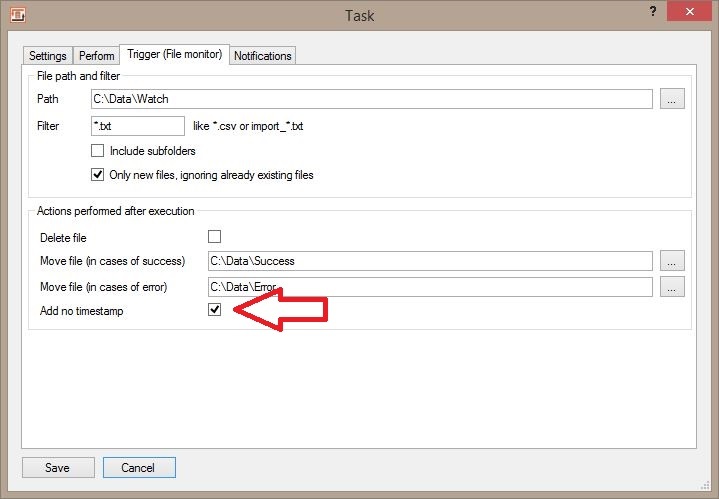 When configuring a tack in FlowHeater Server, there is an option to move the original file to a user-selected folder, after the task completes. It can move it to different folders, based on if the task succeeded or failed. When the file is moved, it is automatically renamed to include a time stamp. I would like to see an option to move the file without renaming it. In many cases the time stamp might be desirable, but as a developer, I would like to have complete control over the file name, and working with the original file name would make it much easier. Thanks for the suggestion. You´re absolutly right, sometimes to rename is just undesired. I´m afraid that currently no option to configure this as you want. We´ll change this with in the next FlowHeater Server version. I’ll post a short update as soon as the new version is available. Any progress on this? It looks like a new version was released, but I don't see this as an option. No, releases like 4..0.8.x are just for bug fixing and some smaller features. This descriped function will be released in Version 4.0.9 it´s planned for end of April. the current Beta Version 4.0.8.3 Beta3 now supports this feature. You`ll find the download links below.